22 Michaels: Kogan taxes IE7 users! 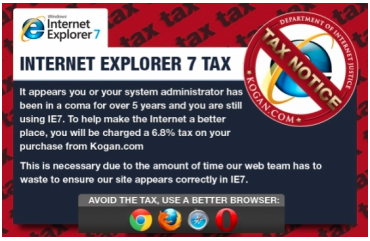 Brilliant - Kogan are 'taxing' users of Internet Explorer 7 6.8% on all their purchases on kogan.com.au because of the time their web team wastes to ensure their site works correctly in the 6 year old IE7! I'm sure many would agree.